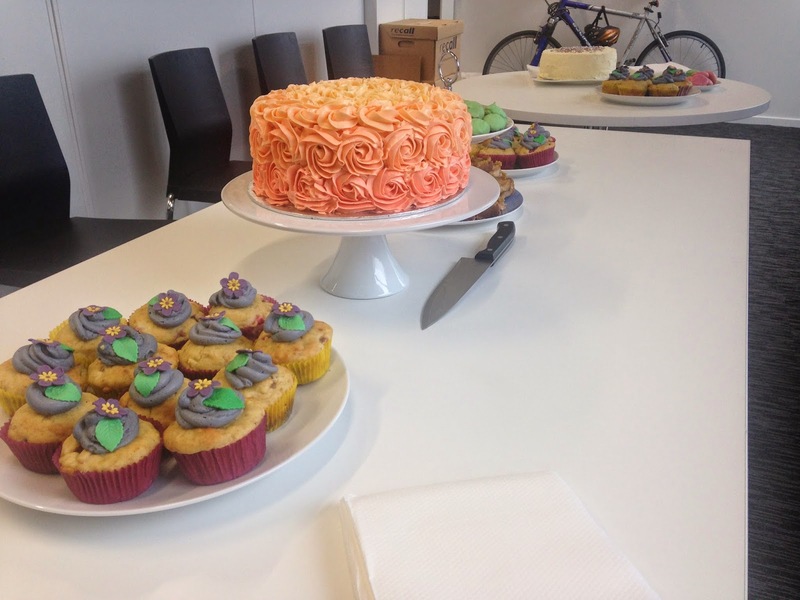 I should point out that I'm not 'farewelling' this blog - after less than six month's efforts! 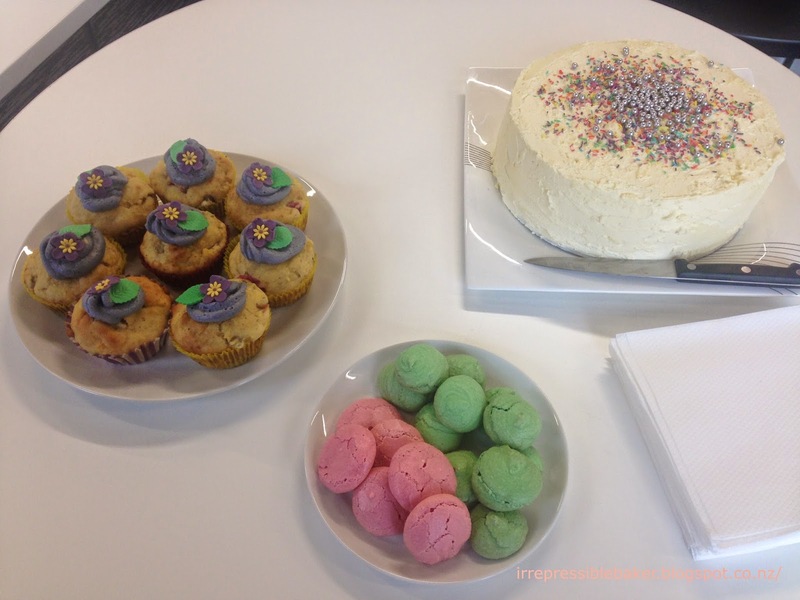 This post is about the farewell morning tea that I held a couple of months ago when I left my previous job. I'm well overdue for a post, and I've been meaning to share the shots and recipes of what I made then, so here goes! Always trying to be classy, I designed a high-tea-like feast centred around sugar! I wanted to use my recently-aquired fondant skills and buttercream designs to get more practice and please a crowd, so I planned three cakey items: a buttercream rosette-decorated chocolate cake, a simple white choc-iced carrot cake, and rhubarb cupcakes with floral fondant decorations. For the 'extras', I had a failed attempt at macaroons (however, you may have noticed that I do not equate 'fail' to 'inedible' so I served them up as meringue bites anyway!) 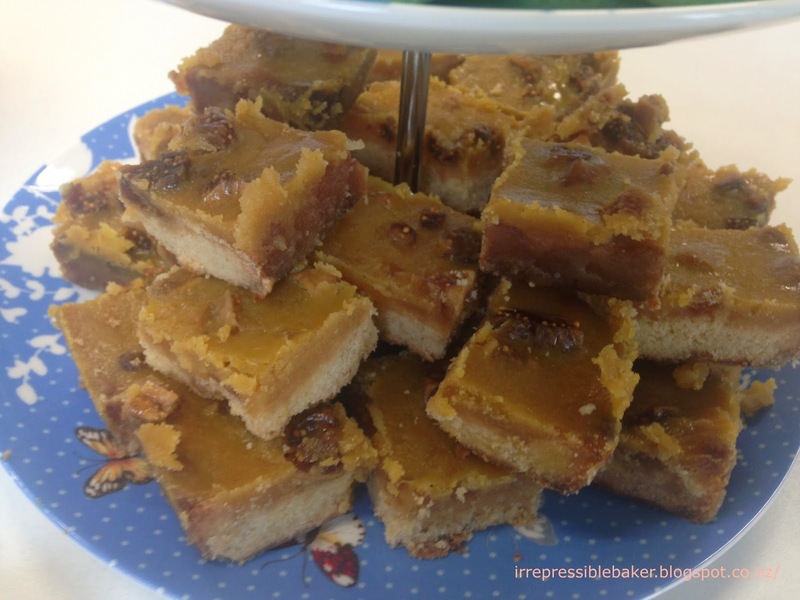 and made a successful batch of fig and ginger slice. I orientated the rosettes in each row in the opposite direction to the ones below them (i.e. I piped in the opposite direction) because I think that it emphasises the slight colour intensity change - and I like to add interest :-) To get the 'ombre' colour change, you start with a small portion of buttercream coloured as dark as you want to go, use it for the bottom row of rosettes, and with (hopefully!) the last bit of that icing, add a whole blob of uncoloured icing and mix to get your next shade lighter. You'd be amazed at how little coloured icing you start with for each consecutive row - colouring goes a long way! I used Wilton's gel colouring in 'creamy peach'. 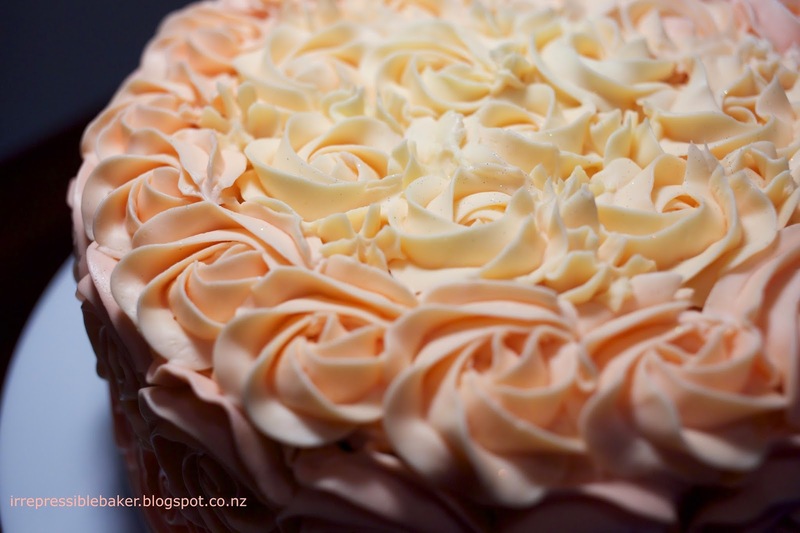 The lighter shades look more orange-y due to the natural yellow of NZ butter! This can be fixed a bit by using a shortening (Crisco, Kremelta, Chefade, etc) to replace some of the butter in the icing. Cake number two was an interesting but delicious one: ginger carrot cake with white chocolate icing (also of Sweetapolita). Although it took FOREVER to cook (and even then wasn't quite done, as I found out when I cut it...), it was definitely tasty, and a nice change to raisin-and-walnut-ified carrot cake. 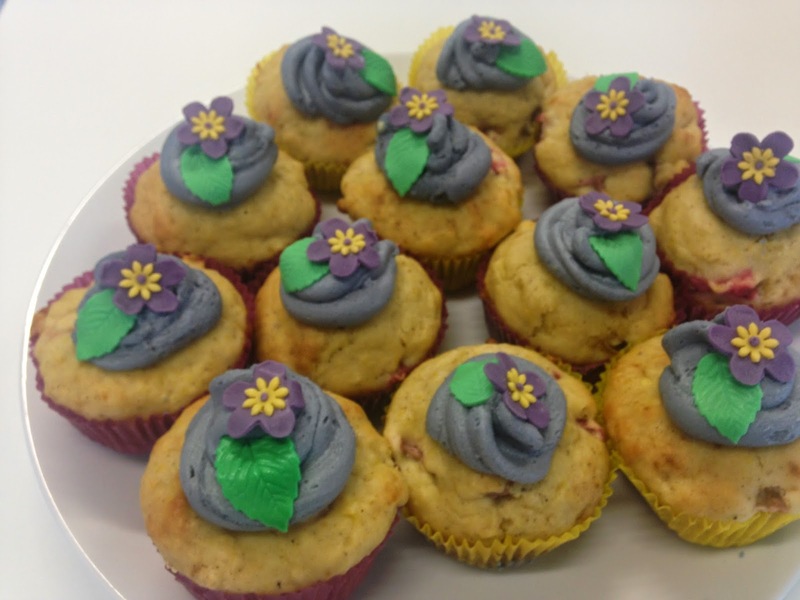 These cupcakes were a bit too numerous for all the other baked goods on offer, but they were eaten up as leftovers (who knew that rhubarb was a favourite of architects!). I adapted Julie Le Clerc's vanilla cupcakes recipe by adding some rhubarb - a couple of cups, chopped and 'marinated' in castor sugar in the fridge. 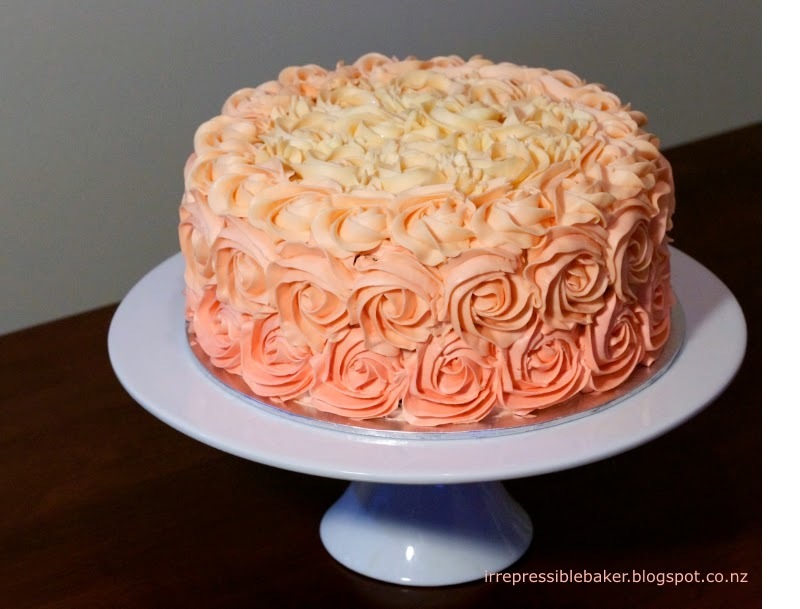 The icing is the simple buttercream recipe used here and the fondant flowers I covered in this post. By the way... you may have noticed that I've started to watermark some of my images with the blog's URL. I'm doing this in particular for the one-of-a-kind, special items that I make (not many at present, but hopefully a growing number) after reading this interesting post about copyright for images. Since my blog is being accessed around the world (hi overseas friends!) I'd love to have people come back to the source to check out where the random images spinning around the web come from. And if one day I ever want to make a dollar out of this, that's the way to play the game.